My Great Grandfather, William spoke to two fishermen both called David Mackenzie (father and son - possibly the two fishermen in the photograph) who lived in the grounds of Brims Castle who, when they could not fish, spent their time digging up the ground around the castle looking for the treasure that local legend said existed. They had not found any treasure but had dug up some skulls with holes in them! William also says "I called this year (1910) at every house within miles of the castle, trying to gather what legends there were about it. I was assured by one old man that his old mother used to tell of a legend she had heard that a Brims and occupant of the castle sent a messenger into Thurso, to a joiner there, asking for a coffin to be laid outside his shop at night. The coffin was removed a dead of night and conveyed to Brims Castle. One of the servingmaids at the castle had disappeared at the time. The matter was hushed up. Local tradition was certainly convinced at that time that a crime had been committed and that this servingmaid had been done away with. The castle is haunted they say, by this white lady. " William was convinced that Sir Walter Scott had used Brims Castle as inspiration for his novel 'The Pirate'. It is known that in the summer and autumn of 1814, Scott travelled around the north coast of Scotland, Shetland, Orkneys and Hebrides. Here is a quote from 'The Pirate' - you can make up your own mind! "....for a Norwegian Chief of those times, or, as other accounts said, and as the name of Jarishof seemed to imply, and ancient Earl of the Orkneys had selected this neck of the land as the place for establishing a mansion house. 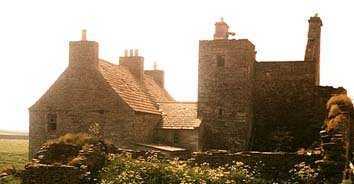 It had been long entirely deserted, and the vestiges only can be discerned with difficulty; for the loose sand borne on the tempestuous gales of those stormy regions, has over blown and almost buried the ruins of the buildings; but in the end of the seventeenth century, a part of the Earls mansion was still entire and habitable. It was a rude building of rough stone, with nothing to gratify the eye or excite the imagination, a large old fashioned narrow house, with a very steep roof, covered with flags composed of grey sandstone, would perhaps convey the best idea of the place to a modern reader. The windows were few, very small in size, and distributed up and down the building with utter contempt for regularity. ...a short distance from the mansion, and near to the sea beach, just were the creek forms a sort of imperfect harbour, in which lay three or four fishing boats, where were a few most wretched cottages...."
As an interesting addition to this story, I was recently contacted by someone from The Walter Scott Digital Archive - where you can see several pictures, depicting The Pirate. 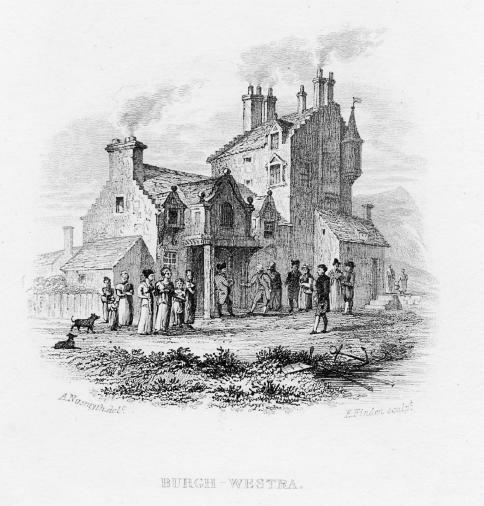 There is one in particular picture that looks quite like some features of Brims Castle - a depiction of The Pirate- subtitled "Burgh-westra" It is a steel ingraving from a drawing by Alexander Naysmith, 1832. I am told that in the coming months there will be many more pictures of this scene as it was a particular favourite of Victorian artists. Father and son, both broad, muscular highlanders, dressed in kilt or plaid of Sinclair tartan, holding onto each other, endeavouring to keep on the path that is within a foot of the perpendicular precipitous rock. "United they stand, divided they fall!" At the top of their voices they are yelling and singing, on their way home, the refrain that they last sung at the chiefs house, - "For he's a jolly good fellow! For he's a jolly good fellow!! For he's a jolly good fellow!!! "......and then with a sudden lurch, John Brymmes, elder, disappears over the cliff, drops down and bounds off from each projecting crag right to a protruding rock 400ft below. His son falls flat, and, rolling over to the edge of the cliff, looks down into the gloomy depths. The wind is howling and the sea, with 50ft waves, is lashing the rocks beneath; the spray is leaping often to the very top. The moon occasionally comes out, and the blackness in places is intensified. "Faither! Faither!" cries the son, and, hoping without hope, he looks and listens. Yes! His practised ear detects the finish of the refrain "Which nobody can deny" in his father's voice. His son hurries down and finds his father, who says he has lost his bonnet. "Are ye hurt, Faither?" "Naw, I wis comin' doon whateffer." Together they wend their way over sand and rocks, blaming the seaweed for being so slippery. At last, they reach their hut, and, rolling away the big flagstone, which does service for a door, they are greeted with the words: "Is that you John?" said by his wife within. John has been trying to sober up a bit for the last hundred yards. "Yes! it's me! "says John, "Whae - hic - whae was ye expectin?" I have to stress, this is myth not legend! This legend was sent to me recently by Jan Sieroversche from Holland. His family have connections with the Brimses in 1620.
" In Old Scandinavian (and old English and old Frisian) The word "Brimmisa" means "the noise that the wind or weather makes" (breezy/stormy weather) and it comes from the name "Brimmyr" who was an angry dwarf and the ancestor of all the dwarfs. This in context with the placename "Thurso" (that doesn't mean Thor's place but Thurs place - place of the giants) shows the historic struggle between the Vikings (the Thurs or Giants) and the original population of Celts (the Brimmysh or Dwarfs)". I think this is especially interesting as in my own 'branch' of the family at least, the Brimses are all quite short! Brims Castle is well known for having a ghost - the white lady. Stories vary as to who she was. In one, Patrick of Brims (aka Black Peter), lived in the castle, and had a 'relationship' with the daughter of James Sinclair of Uttersquoy. The lady mysteriously disappeared. It was hinted at that Patrick did away with her and hid the body in some secret part of the castle. Calder (who wrote 'The Civil and Traditional History of Caithness') believed that Byron modelled his work 'Manfred' on Patrick. He believed that Byron was told the legend by George Sinclair when they were both at Harrow School.